Summary: Gesher Galicia’s unique Maps Project connects people to places across time, and uses geography – scaled from villages to empires – to help tell the stories of people’s lives. When combined with vital records, cadastral maps can help researchers locate the places where their family homes once stood throughout Galicia. 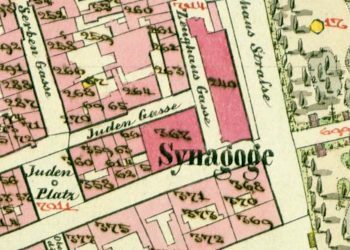 Many Jewish families operated shops and other small businesses from their homes, or owned stalls on market squares; cadastral maps can help locate those also, and some rare examples even show the names of shop owners handwritten directly on the maps. Historical cadastral maps and town street maps show the layout of settlements, including the relationship between residences and the market squares, religious buildings (churches and monasteries, synagogues, schools, and bath houses), government buildings, and the surrounding farmlands and forests, plus the connecting roads, rivers, and rail lines – making it possible to imagine the routes people walked in the past, and to walk those same routes virtually or in person on family history tours. Likewise, historical regional maps help to define the political administration boundaries essential to understanding where records were generated and archived, to identify nearby towns and villages where family members may have moved to or from, and to identify the available means of travel for business or personal reasons as communication routes evolved over more than century, including possible emigration routes that ancestors took to future homes. 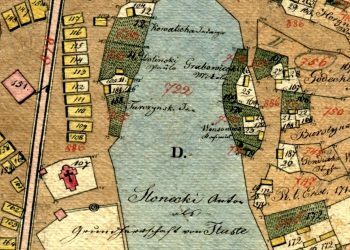 A detail from the 1853 cadastral map of Lemberg (also Lwów, today Lviv), in the Gesher Galicia Map Room. Original map preserved by the Central State Historical Archives of Ukraine in Lviv (TsDIAL). All project output is posted to the online Gesher Galicia Map Room, digitizing and preparing these historical maps for browsing on your computer, as a simple and free modern internet-mapping application. Gesher Galicia first began acquiring digitized historical maps of Galicia and the surrounding regions more than a decade ago under the leadership of Pamela Weisberger. Originally focusing on material in the Central State Historical Archives of Ukraine in Lviv (TsDIAL), the project has since expanded to include maps from other state and municipal archives in southeastern Poland and western Ukraine — as well as from other institutions in central Europe, Russia and North America. The Map Room began online more than five years ago, and the project continues today with over 200 available historical maps and more in acquisition and preparation. A number of illustrated articles about features of selected maps (and methods for using them) have appeared in The Galitzianer, Gesher Galicia’s quarterly journal. A detail from the ca. 1826 cadastral sketch of Tłuste (today Tovste), in the Gesher Galicia Map Room. Original map preserved by the State Archives of Ternopil Oblast, Ukraine. Interesting facts: The Austrian Empire surveyed all of its lands several times during the 19th century, producing high-scale and highly detailed paper maps which document even the smallest villages with their natural and man-made features. Eighteenth-century technical developments in land survey science in France, shortly before the formation of Galicia, enabled land and built features to be documented with high accuracy – in fact, so accurately that original Austrian cadastral maps from the 19th century are still occasionally used in southeastern Poland to resolve modern questions about property lines. The scale and accuracy of the map details means that buildings can be measured and compared, and many sites of heritage (for example, Jewish cemeteries) can be located and sized on their historical footprint. With the maps, the associated cadastral tax records (from Gesher Galicia’s All Galicia Database and other sources) enable economic analyses for both families and communities. Historical analysis is equally effective for Jewish, Polish, Ukrainian, and other communities in each of these places. A detail from the 1878 statistical map of Galicia and Bukovina, in the Gesher Galicia Map Room. Original map preserved by the Jagiellonian Library in Kraków, Poland. Map varieties: The nineteenth and early twentieth centuries were a time not only of cartographic excellence but also of remarkable creativity. Cadastral map makers whose inspiration came more from the arts than from science left behind useful maps adorned with amusing symbols, doodles, and signature flourishes, and as map styles evolved evolved a few cartographers inserted their impressions of the “ruins” in ancient Jewish cemeteries. Some regional maps document the variety of communications in Galicia and the empire, including railways, roads, waterways, and postal routes between towns and cities. Others show battle lines during key military conflicts, such as World War I, to help explain the damage to or destruction of parts or all of some settlements. Specialized maps cover driving and rail routes to accompany a travel guide to the region, or pinpoint medical spas in Galicia, describe common climatic trends in the region, or quantify the ethnographic makeup of hundreds of settlements based on language and religion. 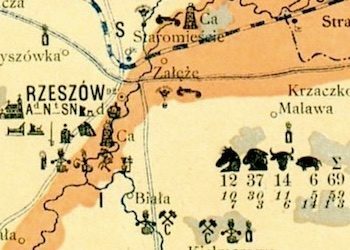 A few maps document the pre-war planning of the Nazi military for southeastern Polish cities, the effects of wartime occupation in some of those same cities, and the post-war memories of survivors about the Jewish communities in their towns before the war. We welcome ideas for additional maps to add to the breadth and depth of the graphical resources of the Gesher Galicia Map Room. 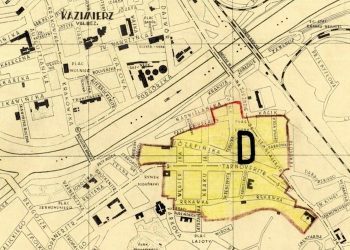 A detail of the Jewish ghetto in the Podgórze district from a Kraków street map under German occupation ca. 1941, in the Gesher Galicia Map Room. Original map preserved by the Jewish Historical Institute in Warsaw, Poland. A new project is currently in progress to link vital and property records directly to cadastral maps via an interactive graphical interface, as part of the Pamela Weisberger Memorial Fund awards for 2017. Initial development and prototype maps will be published to the Map Room website as progress is made. Contributions: Donations to the Maps Project, of whatever size, will be greatly appreciated and will enable us to carry this work forward. As always, we cannot guarantee in advance whether a particular map will be complete, or even available. While historical maps for a great many towns and villages in the lands once known as Galicia still survive in archives, for some places either no maps still exist or the surviving maps are of little value.